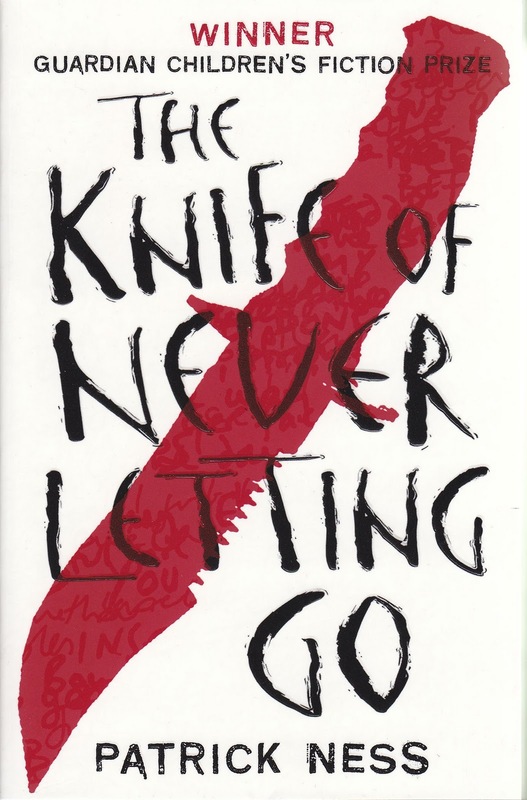 The Knife of Never Letting Go by Patrick Ness is the story of Todd Hewitt, a boy on the verge of manhood who lives in a place called Prentisstown. In Prentisstown there is Noise - every man, boy and animal (there are no women) projects their thoughts and can be heard. Pictures, shouts, dark thoughts, happiness - nothing is secret, all is shared. On a day leading up to Todd's birthday, he is wandering in the swamp near Prentisstown and hears an absence of Noise, something he has never encountered before. At this point Todd's life changes irrevocably and he is forced on the run from everything and everyone he has ever known. This is the best novel I have read this year by a LONG way. It was simply tremendous - breathless, exciting and yet with a heart and morals and discussion points that lifts it far beyond the realm of most YA fiction. I would say quite honestly that it is about the best children's/YA book I have read EVER. Another wonderful facet to the tale is the fact that animals are able to talk as well. The aforementioned Manchee is Todd's dog - and we learn at the start of the book that even though animals CAN talk, it doesn't mean they have anything profound to say: "Squirrel, Todd! Squirrel!" Manchee reminded me a great deal, in fact, of Doug from the Pixar film Up - an amusing sidekick in a lot of ways, but also capable of providing incredibly touching moments. Manchee was probably my favourite part of The Knife of Never Letting Go. The titular knife represented, for me, the march into adulthood that Todd is forced to experience. Early on in the novel it is said that a knife makes no decisions, the hand holding it does - and thereafter is used to demonstrate the decisions that Todd must make as he becomes a man. There is also decent social commentary on what adulthood involves. I liked the way that the fact it is the MEN who project the Noise, and the women who remain silent. It seemed rather a sardonic nod to the fact that this is almost role reversal from real life (or certainly what is perceived to be the case). It also allowed Ness to explore matters of importance to boys and men - not wanting to appear cowardly, discovering morals and lines of honour, how to treat women. All of these were represented both realistically and very sympathetically. Honestly, I cannot wax lyrical enough about this book. I had seen it read and reviewed by others, but had very little interest. I only picked it up this time around because the third novel of the series has been shortlisted for the Arthur C Clarke award - and I am so glad that I was directed to do so. This novel FEELS important. It is horrific, funny and thoughtful by turn - and never less than brilliant. Awesome review for an awesome book! I loved this book in all its horrific symbolism and glory. 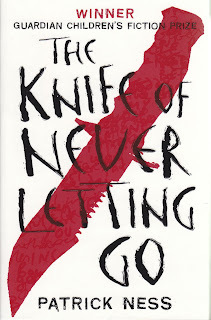 I cannot sing enough praises to Patrick Ness for his genius. :) I also love Manchee -- when I got to THAT part of the book that starred him, I had to stop and pause the reading for a while to make sure my heart doesn't break too much. My crit partner raved about this book, and she's a YA fanatic. It's good to see another review. I plan to read it this summer. I only picked it up this time around because the third novel of the series has been shortlisted for the Arthur C Clarke award - and I am so glad that I was directed to do so. Awesome. This is one of the great things about the award and as one of this year's judges it makes me particularly happy. This series is one of my favourite ever, regardless of genre and age group. The awesome narrative drive, fantastic characters, and not just one or two really huge and complex questions, but dozens. The next in the series is my favourite, it does does everything the first book does, but takes it up about ten notches :) What he manages to do with your perception of certain characters is nothing short of brilliance. And you know what? The series only gets better. You know, the YA/children's section of the stores in Bangalore is very patchy, but I think I've seen this around. I'll look it up.